Join the Corbett Grange for a family Valentine's Day Dance on February 14th. Doors open at 6 pm for Valentine's desserts and visiting, from 7-9 pm there will be dancing and kids crafts. Corbett is a beautiful place with a significant place in history along the Columbia River Gorge. 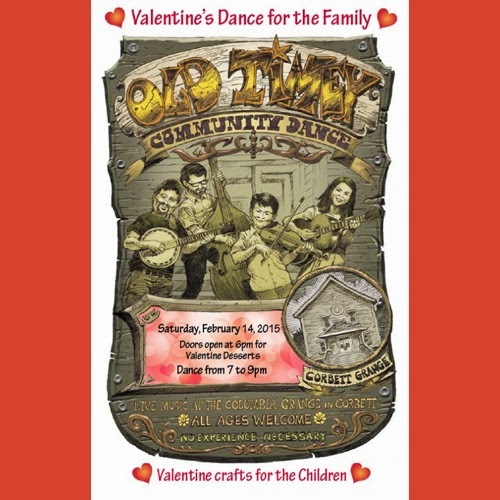 Read about Corbett, OR history below and enjoy the Valentine's Day Family Dance. This community on the Historic Columbia River Highway between Sandy River and Crown Point was named for Senator Henry Winslow Corbett, one of Oregon’s prominent pioneer citizens, for many years a resident of Portland. In 1885, Mr. Corbett purchased a nearby farm from Ervine J. Taylor, who had moved down to the Columbia River about the time the railroad was built in 1882.For many years there was a station named Corbett on the Union Pacific Railroad at the base of the bluff below the community. The station is gone, but there is a small commercial cluster where Corbett Hill Road leaves 1-84 and climbs the hill to connect to the historic highway. The first post office at what is now Corbett was Leader, established in July 1881. The name of this office was changed to Taylor in 1882 and moved down to the river by Ervine Taylor. Corbett post office was later established December 20, 1895, with William H. H. Reed first postmaster. Reed Island on the Washington side of the Columbia River was named for Reed who lived there until washed out by the 1894 flood, after which he moved up to Corbett.